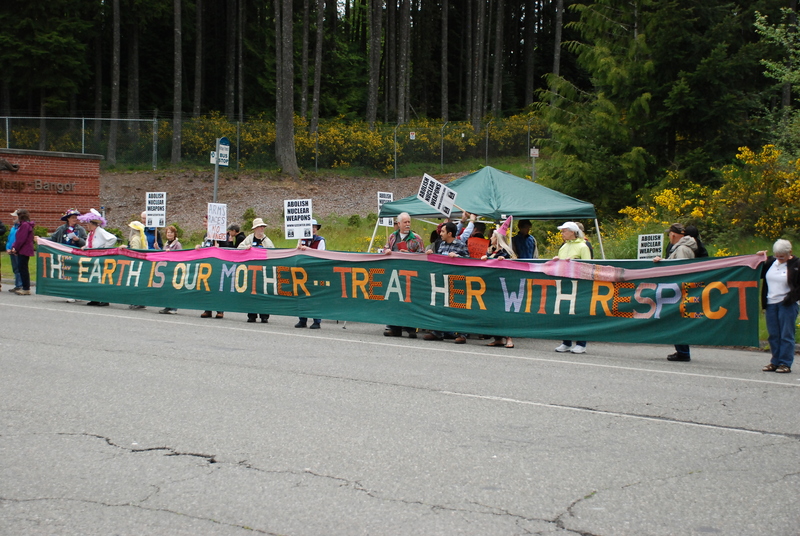 Silverdale, Washington, May 10, 2014: Activists from Ground Zero Center for Nonviolent Action, in Poulsbo, Washington staged a tea party at the main gate of Naval Base Kitsap-Bangor, the West Coast home port for the U.S. nuclear ballistic missile submarine fleet. Protesters walked onto the roadway in successive waves, briefly blocking the entrance, and offered tea and cookies to the Washington State Patrol officers standing in the median. Officers escorted them from the roadway and cited them for walking on the roadway where prohibited. Those cited were Rose Betz-Zall, Seattle, WA; Victor Edward Digilio, Seattle, WA; Anne Hall, Lopez Island, WA; David Hall, Lopez Island, WA; Norm Keegel, Bainbridge Island, WA; Tom Rogers, Keyport, WA; Michael Siptroth, Belfair, WA; and Christine Warmedahl, Port Orchard, WA. 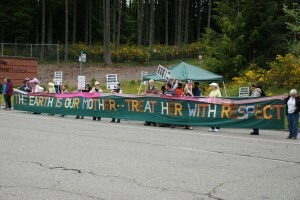 Four of the protestors previously cited re-entered the roadway pulling along a long banner reading, “THE EARTH IS OUR MOTHER — TREAT HER WITH RESPECT”. State Patrol officers arrested Victor Edward Digilio, Anne Hall, David Hall and Michael Siptroth. All four were taken to the Kitsap County Jail where they were booked for obstruction and released. The actions at the Bangor gate were part of a day-long event by Ground Zero to bring attention to Bangor’s nuclear arsenal. Bangor, 20 miles west of Seattle, represents the largest concentration of operational nuclear weapons in the US arsenal. Each of the eight Trident submarines based at Bangor carries up to 24 Trident II (D-5) missiles, each capable of being armed with as many as eight independently targetable thermonuclear warheads. Each nuclear warhead has an explosive force of between 100 and 475 kilotons (up to 30 times the force of the Hiroshima bomb). Participants also engaged in nonviolence training and learned about the current state of nuclear weapons from Dr. David Hall, past president of Physicians for Social Responsibility. Members of the Seattle Raging Grannies provided musical entertainment. The Raging Grannies’ promote global peace, justice, and social and economic equality by raising public awareness through song and humor. Ground Zero continues its legal effort to stop the Navy’s construction of a $715 million Second Explosives Handling Wharf at Bangor. The group is also working on plans to defund the Navy’s program to build a successor to its existing Trident fleet, which was created as a strategic nuclear deterrent to the Soviet Union during the Cold War. The Congressional Budget Office estimates the cost to build 12 new subs at nearly $100 billion. For over thirty-six years Ground Zero has engaged in education, training in nonviolence, community building, resistance against Trident and action toward a world without nuclear weapons.